Nothing celebrates the colder weather like the distinct scent and sound of a crackling log in the fireplace. A steady supply of firewood can help offset your heating costs and, unlike oil and coal, is a renewable resource that can be replanted for future fire-burning pleasure. 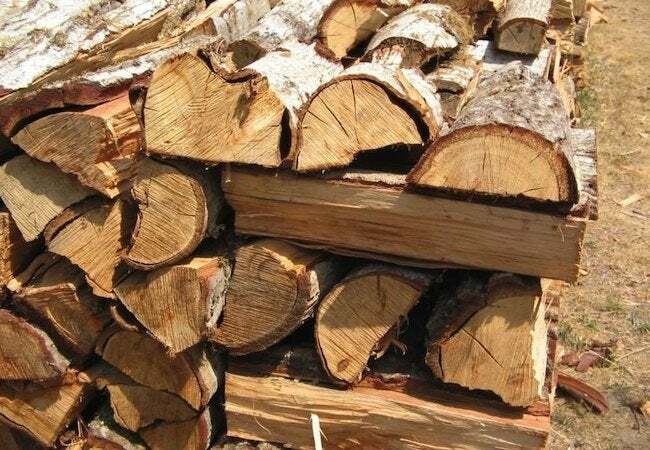 It takes up to a year to properly season wood, but following these guidelines for proper stacking will help keep purchased logs dry and burnable. Related: Firewood Primer: Which Wood Burns Best? The purpose of seasoning freshly cut wood is to remove the moisture for ease of burning. Allocate a dry, sunny spot of your yard for stacking. A well-built pile provides proper ventilation and keeps the wood from being prone to molds or fungus. A haphazard heap, on the other hand, won’t dry, will soak up rainwater, and eventually it will turn into a smelly, rotting mess. Buy or quarter your hardwoods, such as hickory, White Oak, and White Ash (softwoods ignite faster but burn too quickly), remembering that it’s good to get a range of log sizes: Smaller ones catch faster, while the larger, thick pieces burn longer. The most traditional pile has rows of logs held by a support tower at each end. To construct the towers, take two similarly shaped logs and turn them parallel to each other. Build the next layer with two parallel logs that are perpendicular from the first set. Continue until you have about a dozen levels, or as high as you can without letting it get unwieldy. The second tower should be even with but several feet away from the first. In between, lay the logs next to each other so that the cut ends face the direction of the prevailing wind (in the US, weather systems tend to move from west to east, so facing west is a good bet). Keep layering until the pile is the same height as the towers. Place the pieces bark side up to keep them from shedding moisture into the pile. Although it’s tempting to stack all your wood in neat towers, they aren’t as effective for seasoning purposes, as they don’t allow for enough air ventilation. Finally, use long sticks to help bolster the pile, leaning them against the woodpile and stabilizing them in the dirt. The Shaker woodpile, another popular shape, is a round formation in which the sticks touch at one end, but spiral out with bigger gaps. The first layer looks a little like spokes on a wheel, and it’s a good way to use up oddly shaped logs, adding a nice visual presence to the yard.